A Reunion in Pinecraft by Shelley Shepard Gray. Sharon and Sherilyn travels to Shipshewana for a wedding, where they meet Graham. Graham and Sherilyn starts writing letters to one another and look forward to one day meeting again. But there is a twist, Graham finds that he has been writing to the wrong sister. What does he do now? Summer Storm Amy Clipston. Adrianna and Jesse are happy, in love, and about to be married. Only her brother comes along and ruins it and her father refuses to allow the marriage to happen. Will he change his mind or will Adrianna's love be lost to her forever? Lakeside Love by Kathleen Fuller. Esther feels she could never be like her little sister, Sarah. Sarah is the beautiful one and even has the attention of Judah, the one Esther has loved most of her life. How will things change when a Englischer comes to visit for the summer? One Sweet Kiss by Kelly Irvin. Martha has been taking care of her family since her mother died when she was young. She, also, feels she needs to take care of wild boy Jacob. How will one summer change her world forever? 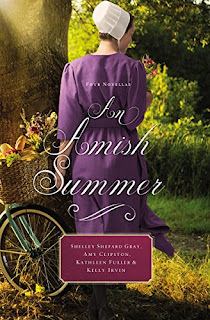 I thought An Amish Summer was pretty good. I enjoyed all of the short, sweet and clean Amish stories. My favorite would have to be Kelly Irvin's One Sweet Kiss. I would recommend this book as it is definitely worth a read.